The purpose of this study in God's word is to show you the reader and seeker of the TRUTH that the time of Great tribulation is NOT the WRATH of Almighty God that will be executed by his Son at the SECOND COMING of Jesus. You see, the strongest argument for defending the PRE-tribulation view is that the children of God are NOT appointed to the WRATH of God, and therefore cannot possibly go through the GREAT TRIBULATION period, because in THEIR mind they see that the WRATH of Almighty God is ONE and the SELF SAME event as the time of GREAT TRIBULATION spoken of by Jesus in Matthew chapter 24 where Jesus is referring back to the prophet Daniel in the Old Testament. Now the Bible does in fact tell us in 1 Thessalonians 1:10 that God has delivered us from the WRATH to come through his Son Jesus. "...even Jesus, which delivered us from the WRATH to come." Of this Biblical TRUTH there is no dispute on my part. We, as Christians, OBEDIENT children of God are NOT appointed to God's WRATH and will NOT suffer the WRATH of God. Of this TRUTH there is NO DOUBT. HOWEVER, using this TRUTH, that Christians are not appointed to the WRATH of God, to defend the PRE-tribulation teaching is NOT SOUND Biblical teaching, because the WRATH of God and the 3 1/3 year period of GREAT TRIBULATION are NOT one and the SAME thing. In other words, they are two different events occurring at two different periods of time. Let me explain what I mean. Open your Bible and read Revelation 6:1-17 and you will see that the first six seals are opened, one right after the other, but there is no mention of the seventh seal being opened UNTIL Revelation chapter 8 and verse 1. So what is my point? I want to draw you attention to the fact that there is a gap or space of time between the opening of the sixth seal and the opening of the seventh seal. If you will take a closer look at the verses of scripture found in this gap, you will find that the rapture of the church has taken place between the opening of the sixth seal and the opening of the seventh seal. "And one of the elders answered, saying unto me, What are these which are arrayed in white robes? And whence came they? And I said unto him, Sir, you know. And he said unto me, These are they which CAME OUT of GREAT TRIBULATION, and have washed their robes, and made them white in the blood of the Lamb." Now with all this in mind it should be obvious that the FIRST SIX SEALS are the GREAT TRIBULATION period, because we are given this information of those coming out of great tribulation right AFTER the first six seals are opened. Keep in mind that the seventh seal has NOT yet been opened. But before we look at the opening of the seventh seal I want you to CLOSELY examine Revelation 6:17, which is at the very end of the opening of the sixth seal. "For the great day of his (God’s) WRATH is come: and who SHALL be able to stand?" First I want you to notice the phrase "is come". The word "come" here is also translated as "coming". So in other words, God’s wrath is just about to take place at the opening of the SEVENTH seal. Also notice that the phrase "who SHALL be able to stand?" is in the future tense. This verse is literally saying that the WRATH of God is about to be poured out upon the ungodly and is asking the question who WILL be able to endure it? But BEFORE the wrath of God is poured out the Rapture of the church must take place, because we are not appointed to the wrath of God. This is exactly what takes place in Revelation chapter 7, which I already discussed briefly above using verses 13 and 14 of chapter 7. Now we will take a look at the opening of the seventh seal, which is the WRATH of God. The opening of the seventh seal takes place in Revelation 8:1 right AFTER we are told about the great multitude in heaven which no man could number which had come out of the GREAT TRIBULATION period and had washed their robes in the blood of the Lamb. "And when he had opened the seventh seal, there was SILENCE in heaven about the space of an half hour." What do you suppose could have produced this great silence, especially after just reading about the great rejoicing in chapter seven? Have you ever noticed how quite a room gets when there is an outburst of anger? Have you ever been in a church service when the pastor is correcting or chastising the church body with righteous anger and experience the SILENCE? Well God’s WRATH, which is his righteous vengeance upon the sinners, will cause this silence in heaven. "Say unto them, As I live, saith the Lord God, I have NO PLEASURE in the death of the wicked; but that the wicked turn from his evil way and live: turn ye, turn ye from your evil ways; for why will ye die, O house of Israel?" "The Lord is not slack concerning his promise (the rapture or his coming again), as some men count slackness; but is long suffering to us-ward, NOT WILLING that ANY should perish, but that ALL should come to repentance." This is God’s ATTITUDE toward all of mankind. God desires all of mankind to be saved. Let’s quickly summarize what I have said thus far. First we have the opening of the first SIX seals, which is the GREAT TRIBULATION period. Then we have the rapture of the church taking place IMMEDIATELY AFTER this period of great tribulation. Again notice that the rapture of the church occurs in this gap after the opening of the first six seals, but BEFORE the opening of the seventh seal, which is the WRATH of God. For a deeper understanding of WHEN the RAPTURE of the church will take place please read the study entitled "THE GREAT TRIBULATION"
Finally we have the opening of the seventh seal, which is again the WRATH of God. In all of this I want you to notice three things: a pattern of 6, a gap or space of time, then comes 7 which you will see more clearly, as we continue to look at the blowing of the seven trumpets and the pouring out of the seven vials. 1. the first 6 is equivalent to the GREAT TRIBULATION period. 2. the gap, or space between 6 and 7 is associated with the RAPTURE. 3. the 7th is clearly seen as the WRATH of God. Bear with me and follow what I am saying and the book of Revelation will begin to interpret itself for you. Again we find another gap or space of time after the sixth trumpet is blown, but before the seventh trumpet is blown. The passage of scripture that covers this gap between the sixth and seventh trumpet is found in Revelation 10:1-11, and Revelation 11:1-15. Now we find in this passage of scripture a key verse that gives us a clue as to why there is a gap or space of time between the sixth and seventh trumpet. "But in the days of the voice of the SEVENTH angel, when he shall BEGIN to sound, the MYSTERY of God should be finished, (accomplished or completed) as he has declared to his servants the prophets." Play close attention to the wording here. Notice that when the seventh trumpet BEGINS to sound, then the MYSTERY of God will be completed, that is accomplished or already finished. Now since there are only SEVEN trumpets mentioned here in Revelation, this would consequently mean that the seventh trumpet or trump is the LAST trumpet that shall sound. "Behold I show you a MYSTERY; We shall not all sleep, but we shall all be changed. 52. In a moment, in the twinkling of an eye, AT the LAST trump (trumpet, the 7th trumpet); for the trumpet shall sound, and the dead shall be raised incorruptible, and we shall be changed." Now the phrase the mystery of God can also be found in Ephesians chapter 3 speaking of the Gentiles be added to the body of Christ along with Israel, however the focus of this study is not to thoroughly explain every meaning of the mystery of God, but rather to show the sound Biblical timing of the rapture of the church. The word “BEGIN” here means the initial setting in motion without reference to what follows, In other words, on the EXACT moment that the seventh trumpet BEGINS to sound, BEFORE any thing else happens or takes place, the MYSTERY of God, which is the RAPTURE of the church, should be finished or accomplished, that is it takes place. Let me explain it another way. The rapture of the church takes place immediately AFTER the blowing of the first six trumpets, which are blown during the GREAT TRIBULATION period. However, BEFORE the WRATH of God is poured out in the blowing of the SEVENTH trumpet, which is the final or LAST trumpet, the rapture of the church takes place. In other words, this MYSTERY of our CHANGE takes place. "But in the days of the voice of the SEVENTH angel (which is the seventh and LAST TRUMPET), when he shall BEGIN to sound (or AT the last trumpet), the MYSTERY (behold I show you a MYSTERY 1 Corinthians 15:51) of God should be finished." (in a moment and a TWINKLING of an eye). Now we will find that the sounding of the seventh and LAST trumpet in Revelation 11:15-19 to clearly be seen as the WRATH of God. "And the SEVENTH angel sounded…(verse 18) And the nations were angry, and your WRATH is come, and the time of the dead that they should be judged, and that you should give reward unto your prophets, and to the saints, and them that fear your name, small and great; and should destroy them which destroy the earth. 19. And the temple of God was opened in heaven, and there was seen in his temple the ark of his testament: and there were lightnings, and voices, and thundering, and a great earthquake, and great hail." "And after three days and a half (which is a literal 3 1/2 days, but may also be interpreted to mean the three and a half years of great tribulation) and the spirit of life from God entered into them, and they stood upon there feet (resurrected); and great fear fell upon them which saw them. 13. And they heard a GREAT VOICE from heaven saying unto them COME UP HITHER (This is a type or a description of the rapture of the church). And they ascended up to heaven in a CLOUD; and their enemies beheld them." 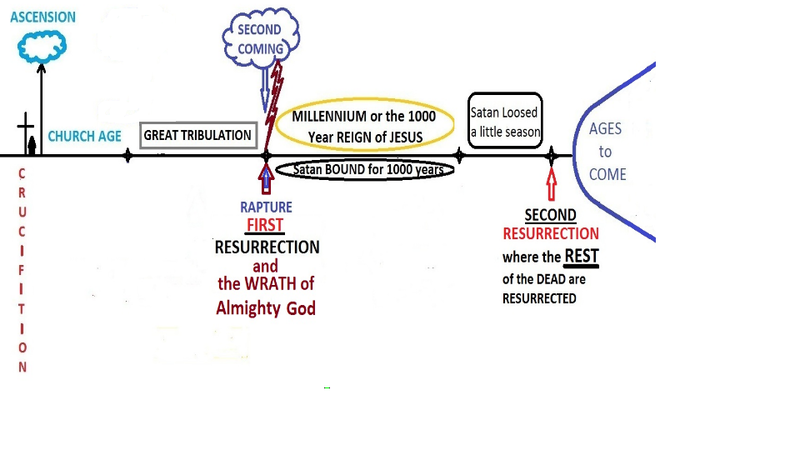 Let’s do a little review to show that this pattern of SIX, which is the great tribulation period, then the GAP, which is where the rapture of the church occurs, then comes SEVEN, which is when the wrath of God is poured out. We have now seen this pattern of three things in BOTH the seven seals AND the seven trumpets. So what does this mean? Well quite simply it means that the seven seals and the seven trumpets COINCIDE, that is, they both take place SIMULTANEOUSLY. The book of Revelation is written in an exploded view style. Let me explain what I mean by an exploded view style of writing. First we are shown the opening of the seven seals, which gives us a general over view of what takes place, somewhat like a big map. Then we are told of the blowing of the seven trumpets, which is a more detailed view of the seven seals, like when an exploded view of the map is shown to give GREATER DETAIL. Finally we are shown the pouring out of the seven vials, which is even a more exploded view of the seven trumpets, which are a magnification of the seven seals. In other words, the seven seals are magnified so that we can take a closer look. This magnification or exploded view is called or named the seven trumpets. Then this magnification of the seven seals, which is referred to as the seven trumpets is again exploded into a larger view so that we can see even more detail. This final magnification is called or named the seven vials. So in reality the seven seals, the seven trumpets, and the seven vials are all one and the same, that is to say, they all occur simultaneously. But NOT necessarily seal #1 coincides with trumpet #1 and so forth. Now let’s look at the seven vials to see if this pattern of six, a gap, then comes seven is present as well. Open your Bible and read Revelation 16:2-14 and you will see the pouring out of the first six vials, also called the seven last plagues. Again you will notice that they are poured out one right after the other. However the gap or space between they pouring out of the sixth and the seventh vial is not as large or as drastic as in the seven seals and the seven trumpets, but none the less the gap is still present. The gap is comprised of verses 15 and 16. Let’s take a look at Revelation 16:15,16 and see what takes place is this gap between the sixth vial and the seventh vial. “Behold, I come as a THIEF. Blessed is he that WATCHES, and keeps his garments, lest he walk naked, and they see his shame. Again we can plainly see that the rapture has taken place between the sixth and seventh vial. The rapture of the church is also described as the GATHERING of the saints TOGETHER. Look at 2 Thessalonians 2:1. Be NOT DECEIVED my dear brothers and sisters in the Lord, TAKE HEED to this WARNING that our Lord and savior gave to US the CHURCH to be READY and for us to WATCH and PRAY and for us to be WITHOUT SPOT or BLEMISH and if we are NOT READY, then Jesus will come upon US as a THIEF in the night to execute God's WRATH upon US. God is calling men every where to REPENT and get SIN out of our lives. For a deeper understanding on the subject please read the study entitled "WITHOUT HOLINESS NO MAN SHALL SEE THE LORD". Yes verse 15 and 16 is yet another description of the rapture of the church. It is the fifth of seven such types or descriptions of the rapture that are found in the book of Revelation alone. We shall all be given immortal bodies at the time of the rapture, and then we will all be GATHERED TOGETHER, to a place called Armageddon to execute judgment upon the ungodly. It is THEN, only AFTER the rapture or mystery of God is finished that the WRATH of God is poured out when the SEVENTH vial is poured out, because the church is NOT appointed to the wrath of God. Look at verses 18-21 and you will again see that the SEVENTH is the WRATH of God. “And there were voices, and thunders, and lightnings; and there was a great earthquake, such as was not since men were upon the earth, so mighty an earthquake, and so great. 19. And the great city was divided into three parts, and the cities of the nations fell: and great Babylon came into remembrance before God, to give unto her the cup of the wine of the FIERCENESS of his WRATH. Jesus is coming again as a thief in the night to execute judgment or wrath upon the ungodly. However, just prior to the pouring out of God’s wrath, there will be a resurrection of the dead in Christ FIRST, and then we which are alive and remain, that is have survived and REMAINED ALIVE through the great tribulation period, will be CHANGED in a moment, in a twinkling of an eye, TOGETHER with the now newly resurrected saints of God, those that sleep in Jesus, the dead in Christ. This event is called the RAPTURE of the church. The SECOND COMING of Jesus and the RAPTURE of the church are ONE and the SAME event. It is at this time that we are caught up together to meet our Lord in the air. All the saints of God who have kept their garment free from sin will ascend into the clouds to meet with Jesus, and then we will ALL be GATHERED TOGETHER to the place in the Hebrew tongue called Armageddon to execute judgment upon the ungodly along with Jesus. Look at Revelation 18:6, then verse 4. Yes, the Bible teaches that those who are living without sin are NOT appointed to God’s wrath, but the GREAT TRIBULATION period is NOT the WRATH of God. The FIRST SIX seals, the FIRST SIX trumpets, and the FIRST SIX vials are the GREAT TRIBULATION period. THEN immediately AFTER this time of great tribulation, Jesus will come a SECOND time to execute vengeance upon the ungodly, but just prior to this pouring out of God’s WRATH the RAPTURE of the church will take place. AFTER the MYSTERY of God, that is to say, the RAPTURE is finished, or has taken place, then the SEVENTH seal, trumpet, and vial will be administered. This SEVENTH is the WRATH of God and will not TOUCH the child of God that has kept his or her self free from sin. Learn "HOW TO LIVE YOUR LIFE FREE FROM SIN" Please read this study, so you will be prepared for the great tribulation period. “He (God) shall DELIVER you in SIX troubles (that is to say, the six seals, the six trumpets and the six vials of the great tribulation period); yea in SEVEN (the seventh seal, trumpet, or vial, which is the WRATH of God) there shall NO EVIL TOUCH YOU (in other words we are NOT appointed to the SEVENTH, which is God’s WRATH. The WRATH of God will not touch those of us who are found faithful and worthy). 20. In famine he shall REDEEM you from death: and in war, from the power of the sword. 21. You shall be HID from the scourge of the tongue: neither shall you be AFRAID of destruction when it comes. 22. At destruction and famine you shall LAUGH; neither shall you be afraid of the beast of the earth. 23. For you shall be in league with the stones of the field: and the beasts of the field shall be at PEACE with you. “Flee fornication. Every sin that a man does is without the body; but he that commits fornication sins against his own body. 19. What? Know you not that you are the TEMPLE of the Holy Ghost which is IN you, which you have of God, and you are not your own? God is a HOLY God and he commands us in 1 Peter 1:16 to be Holy EVEN as he is Holy. God is not going to command us to do something that we are not ABLE to do through the power of his Holy Spirit. If you are making excuses about sin in your life, especially if you are a Christian, by saying things like, “it is alright, it is not that big of a deal, God will forgive me", because it seems insignificant in your eyes, or you reason that good may come out of it. Or perhaps you are comparing yourself with others by measuring your goodness with their sinfulness saying, "well at least I am not as bad as they are”, then you are DECEIVING yourself and you are headed for destruction. You are literally removing the hedge of God’s protection that has been placed around you EVERY TIME you give into what tempts you and SIN. Every time you ALLOW sin in your life you are in effect placing yourself BACK into the dominion of Satan. The Bible says that we are to judge ourselves LEST we be judged. Judgment is coming and the word of God warns us that it will BEGIN at the house of God, that is to say judgment will begin with Christians. Even a casual look around will tell you that something is about to break loose upon the earth. Judgment is nigh and is even at the door. Jesus is coming soon. Prepare you the way of the Lord by keeping sin out of your life and teaching others to do the same. Now that it is established with a SOUND Biblical foundation that the GREAT TRIBULATION and the WRATH of God are two SEPARATE events, I would like to explore some scriptures that gives us SIGNS to WATCH for that will usher in the wrath of God. That is to say, signs that will be present just prior to the wrath of God. I will share these scriptures with you in the next study entitled "THE SECOND COMING OF JESUS"